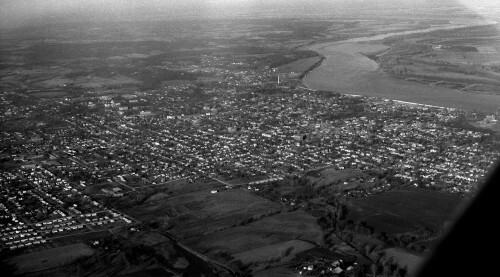 These two photos, taken in 1966, show the heart of Cape Girardeau, looking from the southwest to the northeast. Click on them to make them larger. I increased the resolution of the photos so you can see more detail. 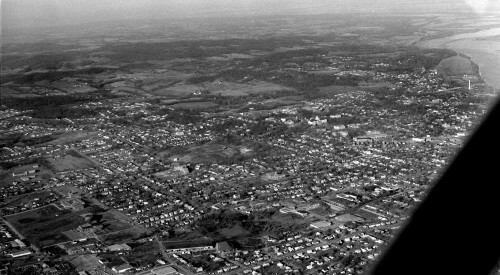 Cape Central High School is in the bottom left. Diagonally to the right would be Southeast Hospital. Academic Hall and Houck Stadium are in right center. There’s a white smokestack next to the river on the right side just above the wing strut of the airplane. The shoe factory is in front of it, so that must be the old power plant. What’s interesting is that Cape quickly becomes farm land once you get behind the university. Cape, when you get right down to it, wasn’t all that big of a town in 1966. The plane had flown slightly more to the east in this photo. You can see Cape’s floodwall gleaming in the sun at the right. The white smokestack mentioned above is more prominent, and you can make out the shoe factory smokestack if you look closely (or have a good imagination). 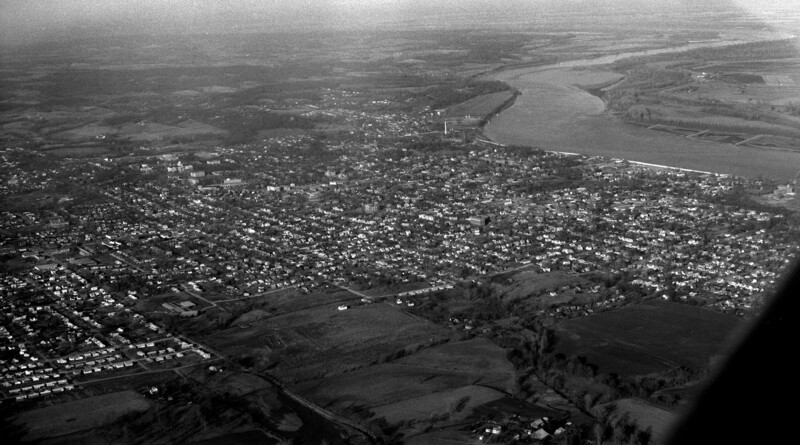 The Mississippi River Bridge barely shows up next to St. Vincent’s Seminary on the far right center. The trees sticking out on the curve of the Mississippi River north of town would have been Cape Rock. Most of the daytime hours that I spent in CG were in an approximate area between CHS, Capaha Park, SEMO, Broadway to Main, Main Street where I worked at Zickfield’s, the Public Library, and the Independence area back to CHS. I can remember walking everywhere without giving it a thought. Sometimes I would ride the city bus from Main out Broadway after work, but I always walked to school. CG always felt like a small town to me. Same here Jane. My area was a bit larger–Arena Park inward–but shoe leather took me where I had to go rather quickly. I remember my mother saying that it was three miles from our house to Trinity Lutheran School. The old saying in the newspaper business is, “If your mother says she loves you, you still need two confirming sources,” so I plugged those two locations into my Garmin Mapsource program to verify her math. Garmin says it’s 2.9 miles, with an estimated driving time of 7:12. I guess I’ll give her a pass on the tenth of a mile discrepancy. She might take some corners wide or I might have missed slightly on the placement of the school. Still, even though if felt like we were a long way out, that’s nothing by today’s commuting standards. Ah, shoe leather….a thing of the past. Jane, Saturday was the day when you and Pam and I would walk to the library, and everyone walked to Capaha Park for the Am. Legion baseball games. Speaking of the size of Cape, I always wondered why Cape didn’t grow like Springfield did. We lived on the northern end of town…1414 Mississippi Street until High School. So my walking range was West End Blvd. North to Bertling and South to Capaha Park and East to the river via Crawdad Land. The west far range was to Mike Roger House on Hopper Road…a little north of Rus Doughty’s house,Rogers’ house was a real hike, but when I got my bike I did do it several times in sixth grade. I always road the School Bus so I knew where things were, but never the city buses… Well once, to the Grand Opening of the Town Plaza, but that was a disaster, how was I to know there were TWO bus routes in Cape, and we (Lyman Brown and I) got on the southern route and they dropped us of at Sprig street at the Mobile gas tanks and we walked all the way home, because we did not have dime to get back on the bus! After that I never road again, don’t know why just never thought of it? Now I wish I had…maybe. Cape has grown, but not centralized like many cities…it just spread out more. Like Bill East used the Shoe leather express every where and it was really shoe leather not running shoes like today!